From the Hematology-Oncology Section, The University of Oklahoma Health Sciences Center, Oklahoma City, OK.
© 2000 by The American Society of Hematology. This article, “How I treat patients with thrombotic thrombocytopenic purpura-hemolytic uremic syndrome,” is no more than the title states. It is a concise review of the clinical syndromes, followed by a description of diagnosis and treatment. There are some observations from published case series that can guide us, but other than the randomized clinical trial demonstrating superiority of plasma exchange over plasma infusion,1 there is no firm evidence on which to base recommendations. Hence, there are no recommendations here, only opinions from my experience. The presence of the primary diagnostic criteria is sufficient to establish a presumptive diagnosis of TTP-HUS and to begin plasma exchange treatment.1,4 The additional clinical features support the diagnosis but may not be present. Profound weakness is a common symptom that appears to reflect more than just rapidly developing anemia. Abdominal symptoms are present in many more patients than those with infectious bloody diarrhea. Although fever may occur as part of the TTP-HUS syndrome,3 high fever with shaking chills more likely indicates sepsis as the primary diagnosis. Adults who have the defining diagnostic features of TTP (Table 1) but in whom acute renal failure is a prominent abnormality, with or without a diarrhea prodrome, have been described as having adult HUS, and some consider this as a distinct syndrome. However, the one prospective study of plasma exchange treatment of TTP-HUS in which patients were distinguished on the basis of renal failure demonstrated no differences in other clinical features. The severity of thrombocytopenia and anemia, and the frequency of focal neurologic signs or symptoms, were the same in patients with or without acute renal failure.1,13 This study also reported no difference in survival rates between patients without (78%)1 or with (83%)13 acute renal failure. This review, focused on evaluation and management in adults, will not distinguish between TTP and HUS but, rather, will use the term TTP-HUS to describe all patients. The presence or absence of acute renal failure may be important for prognosis, but the heterogeneity among TTP-HUS syndromes in adults is much greater than this single distinction. Table 2 presents a classification of TTP-HUS syndromes based on disease associations and probable etiologies. These adult syndromes are similar regarding diagnosis and management, despite their different etiologies, disease associations, and long-term outcomes. These categories describe the presentations of patients in The Oklahoma TTP-HUS Registry for whom plasma exchange treatment was begun for clinically suspected TTP-HUS.7 The approximate relative frequencies of these categories are: idiopathic, 40%; additional/alternative explanation, 20%; others, 10%. Not included among these categories are children, most of whom present with bloody diarrhea11 and who are not treated by plasma exchange; the youngest patient in our Registry is 14 years old. All patients fulfilled diagnostic criteria for TTP-HUS. The assignment of drug-induced categories as allergic or dose-related toxicity is based on clinical observations. Among patients with an additional or alternative explanation for the clinical features, some had an apparent additional diagnosis (eg, systemic lupus erythematosus44) when plasma exchange treatment was begun. In others an alternative explanation for the clinical features only became apparent later, and then treatment was stopped (see Table 3). Selected references are provided. Oklahoma has a unique opportunity to describe this clinical syndrome because all patients from our region with clinically suspected TTP-HUS are treated with plasma exchange by a single institution, the Oklahoma Blood Institute. The Registry began on January 1, 1989; 211 patients have been treated to the present (April 1, 2000). The number of patients treated per year has increased from 4 in 1989 to 28 in 1999, consistent with the 7-fold increase between 1981 and 1997 reported by the Canadian Apheresis Group.23 This remarkable increase may be attributed to the decreased diagnostic stringency described above, with the inclusion of a broader spectrum of disorders, and to the increased awareness of TTP-HUS. It is important to emphasize that The Oklahoma TTP-HUS Registry is not a case series of patients with TTP-HUS but of patients referred for plasma exchange treatment for clinically suspected TTP-HUS. This distinction is critical. Many patients had additional diagnoses when plasma exchange treatment for TTP-HUS was begun, or alternative diagnoses were subsequently discovered. Patients in whom alternative diagnoses became apparent (Table 3) are probably excluded from most reported case series, yet on their initial evaluation TTP-HUS was the primary diagnosis. If these patients had died acutely with no autopsy, TTP-HUS would have remained the primary diagnosis. Since January 1, 1995, I have participated in the management decisions for 122 (85%) of 143 patients. Follow-up is complete to the current time for 115 of 116 living patients. In patients with established diagnoses of preeclampsia, TTP-HUS may be suspected because of the severity of neurologic and renal abnormalities and their persistence for longer than several days after delivery. Patients with an autoimmune disorder in whom hematologic, neurologic, and renal manifestations are severe and refractory to immunosuppressive treatment may be treated with plasma exchange for a possible additional diagnosis of TTP-HUS. In some patients, an alternative explanation for the signs and symptoms of TTP-HUS only becomes apparent or appreciated after plasma exchange is initiated; some examples from The Oklahoma TTP-HUS Registry are listed. Selected references are provided. In the absence of a gold standard-defining test, the diagnosis of TTP-HUS rests on the signs and symptoms presented in Table 1. The primary criteria are thrombocytopenia and microangiopathic hemolytic anemia. However, some patients may not initially be anemic, though their hematocrit levels may fall sharply after presentation, and in some patients red cell fragmentation may not be apparent.24 Serum lactate dehydrogenase (LDH) levels are increased, often to very high levels, reflecting not only hemolysis but also diffuse tissue ischemia.25 The absence of a clinically apparent alternative explanation for these abnormalities is the critical but difficult component of the diagnosis. For example, a patient with megaloblastic anemia may, on initial examination, have mental status changes, thrombocytopenia, and anemia characterized by many red cell fragments and elevated serum levels of bilirubin and LDH. If the initial evaluation suggests TTP-HUS but other etiologies are possible, can plasma exchange be withheld? Often it cannot. Table 3 shows the disorders that may accompany the diagnostic features of TTP-HUS. Many of these disorderssuch as preeclampsia, autoimmune disorders, and malignant hypertensionmay have the pathologic features of thrombotic microangiopathy that are characteristic of TTP-HUS.9 This diagnostic dilemma is not new; among the survivors in the defining case series were patients with systemic lupus erythematosus, and one had meningococcemia.3 Therefore, an initial diagnosis of TTP-HUS is often tentative, and the physician must remain vigilant for an alternative diagnosis. With the exception of the study demonstrating the superiority of plasma exchange over plasma infusion1 and a small study demonstrating the equivalence of fresh frozen plasma and cryosupernatant plasma for the initial treatment plasma,26 there are no randomized clinical trials to provide data for management decisions. The following observations, then, are based on opinion, not on evidence. Because syndromes described as TTP or HUS may be indistinguishable (except for the presence of acute renal failure in HUS) and both respond to plasma exchange treatment (see above), vWF-cleaving protease assays cannot be expected to provide therapeutic guidance. The algorithm for our treatment is presented in Figure 1. Figure 1. Algorithm for the management of patients with TTP-HUS. Solid arrows represent an ideal course; broken arrows represent common variations. The decision to initiate plasma exchange, often the most difficult step, is addressed in Tables 1 to 3. Once treatment is initiated, physicians must remain alert for alternative diagnoses. A “poor response” is not easily defined. It may indicate persistent, severe thrombocytopenia and hemolysis after several days of plasma exchange, or it may indicate recurrent, acute thrombocytopenia and hemolysis after an initial good response, or the appearance of new neurologic abnormalities, while the patient is continued on once daily plasma exchange. Consolidation treatment is empirical and is based only on observations that exacerbations of TTP-HUS are common when plasma exchange is stopped. Other considerations, such as complications with venous access, may override a decision to extend treatment. In many patients, repeated reinitiation of daily plasma exchange is required before durable complete remission is established. No maintenance treatment or specific diagnostic test appears to prevent or predict a relapse. The definitions of exacerbation and relapse, as occurring within or beyond 30 days of remission, are arbitrary. The response to plasma exchange treatment is variable, perhaps reflecting the heterogeneity of TTP-HUS syndromes. Nonfocal neurologic symptoms, such as mental status changes, may resolve immediately and dramatically. Thrombocytopenia typically requires several days for initial recovery to begin. Parameters of hemolysis, such as serum LDH levels, may improve promptly, yet anemia may continue to worsen and further red cell transfusion is often required. Renal failure may also worsen before improvement is noted; recovery from renal failure is unpredictable and often slow, and it may be incomplete. The platelet count seems to be the most important parameter on which to base treatment decisions. Failure of the platelet count to respond requires intensifying treatment. Exacerbation of thrombocytopenia after initial recovery, while the patient continues to receive daily plasma exchanges, signals increased disease activity and necessitates more intense treatment. Recurrent or new neurologic abnormalities may occur during the course of treatment;1 these events are usually predicted by an exacerbation of thrombocytopenia. 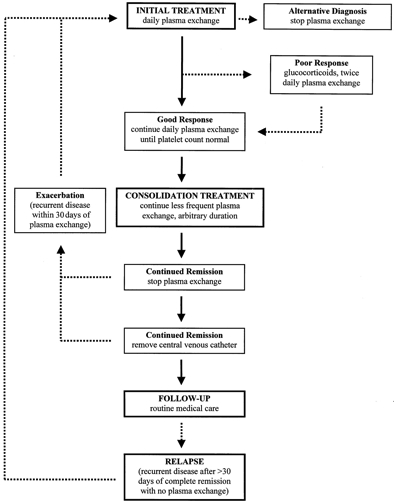 Often a prompt initial increase of the platelet count is followed by a period of several days with no change, suggesting a diminished response to plasma exchange; in these patients, simply continuing the daily plasma exchange is usually sufficient. If the response to initial treatment is poor, with either no platelet count response or an exacerbation of disease activity during daily plasma exchange, glucocorticoids are added and the volume of plasma exchanged is increased. Glucocorticoid may be oral prednisone (1 mg/kg per day) or higher doses of intravenous methylprednisolone (125 mg twice daily). Plasma exchange may be intensified by increasing the volume of plasma replaced to 1.5 plasma volumes per exchange; our practice is to initiate twice daily exchanges of 1 plasma volume to minimize the recycling of infused plasma. This is a formidable procedure requiring nearly full-time personnel commitment, but refractory patients appear to respond to this plasma dose escalation. Many other modalities have been recommended (splenectomy, aspirin, dipyridamole, vincristine, other immunosuppressive agents, and IVIg), but their efficacy is unclear. The variable clinical course of TTP-HUS makes all anecdotal reports uninterpretable. Persistence and patience with plasma exchange may be the most effective practice. No clinical parameters predict the required duration for plasma exchange. When remission is established (based on recovery of the platelet count to normal), nonfocal neurologic symptoms are resolved, the hematocrit level is stable but will not yet be normal, the serum LDH value is normal or nearly normal, and renal failure (it is hoped) is beginning to ameliorate. The decision to stop or to continue plasma exchange at this time is empirical. Prompt exacerbation of disease activity, principally manifested by a falling platelet count and requiring the resumption of daily plasma exchange, is common after the discontinuation of plasma exchange treatment, with reported frequencies of 29% to 82%.1,27,29-31 This seems to mandate additional treatment, analogous to “consolidation treatment” used in other disorders. Diminishing the frequency of plasma exchange to several times per week is practical for most patients. The feasibility of continued plasma exchange is often determined by practical, logistical issues such as the safe and efficient function of the central venous catheter or a patient’s ability to return for outpatient treatment. Discontinuing plasma exchange treatment is the only way to know whether a durable remission has been achieved, and many cycles of stopping and resuming plasma exchange may be required. The additional modalities described above are often suggested for patients requiring prolonged treatment, but here also persistence with intermittent plasma exchange may be the best way to control disease activity until remission occurs. The response to treatment may be related to the category of clinical presentation (Table 2). Prolonged courses of plasma exchange treatment, with frequent exacerbations when treatment is tapered or stopped, are characteristic of patients with idiopathic TTP-HUS. Patients with TTP-HUS caused by quinine or ticlopidine hypersensitivity, pregnancy, or an enteric infection with bloody diarrhea typically respond promptly and completely. Although the role of plasma exchange treatment in their recovery may be uncertain, in the acute urgency of initial management plasma exchange treatment cannot be withheld. A review of patients with ticlopidine-associated TTP-HUS has demonstrated decreased mortality rates in patients treated with plasma exchange.32 Patients with TTP-HUS caused by dose-related drug toxicity (eg, mitomycin C) or allogeneic marrow transplantation may not benefit from plasma exchange treatment. In contrast to other patients, these patients are often diagnosed and treated after several days of deliberation. Finally, the patient who has a clinically apparent additional diagnosis, such as systemic lupus erythematosus, has an unpredictable course. Management of plasma exchange treatment is often dictated by the activity of the associated condition. Prolonged courses of plasma exchange are uncommon; exacerbations and relapses of presumed TTP-HUS are rare. Platelet transfusions may be dangerous in patients with TTP-HUS. Patients have been observed to have abrupt, striking deterioration after platelet transfusion, consistent with the exacerbation of thromboses.27 However, we have not observed adverse effects from platelet transfusions when they were required for an invasive procedure. Plasma exchange treatment entails frequent and dangerous risks (Table 4).33 In our prospective study of 71 consecutive patients treated for clinically suspected TTP-HUS, 21 (30%) patients had 27 major complications, including 12 systemic infections (1 fatal) and 2 episodes of hemorrhage after subclavian catheter insertion (1 fatal).33 Other major complications included pneumothorax, catheter thrombosis requiring removal of the central venous catheter, venous thrombosis requiring anticoagulant treatment, hypoxia and hypotension, and serum sickness.33 Consistent with previous observations,34 hemorrhage with catheter insertion was not related to the severity of thrombocytopenia; major bleeding did not occur in 17 patients whose platelet counts were lower than 20 000/µL. Because of the frequency of infections and thrombotic complications, central venous catheters should be removed as soon as possible, but this decision is balanced by the estimated risk for TTP-HUS exacerbation with the requirement for the resumption of plasma exchange. Data are adapted from a study of 71 consecutive patients treated with plasma exchange for clinically suspected TTP-HUS.33 Complications occurred in 43 (61%) of patients; complications were defined as major in 21 (30%) patients and caused 2 deaths.33 No transfusion-transmitted infections were detected. With some machines and settings, unintentional plateletpheresis may be an explanation for persistent thrombocytopenia when other features of TTP-HUS have resolved. Relapse is not the only concern after successful treatment. Chronic renal failure, defined by a creatinine clearance less than 40 mL/min at 1 year after diagnosis, occurs in one fourth of our patients.7 This is comparable to the experience with children after diarrhea-associated HUS, in whom the frequency of renal function abnormalities and hypertension increases during long-term follow-up.37,38 Some patients report minor but persistent and troublesome problems with fatigue, memory, and concentration. Their significance is unknown. We are documenting and defining these symptoms by annual quality-of-life assessments. Emotional support for patients is another important aspect of management. Coping with a disease unfamiliar to them, their families, and often their primary care physicians can be difficult, and they often have feelings of isolation and vulnerability. These problems led several of our patients to urge me to begin a support group. Although I initially had reservations, we began in 1996, and this has become a well-attended and appreciated occasion 3 times each year. We have also established a series of newsletters to patients and physicians that are distributed throughout our community and are posted on our website (http://moon.ouhsc.edu/jgeorge). Definition. There is a need to define accurately those patient groups in published case series, using explicit criteria to include and exclude patients, to define acute renal failure when patients are described as having HUS, to document the presence or absence of associated diseases and possible etiologies, and to describe clinical outcomes. Simply identifying patients as having TTP or having HUS is insufficient. Diagnosis. There is a need to develop diagnostic tests and to define clinical features that can be helpful in determining which patients require treatment with plasma exchange and which patients may be safely observed without plasma exchange. Specifically, there is a need to determine the importance of the vWF-cleaving protease activity in diagnostic and management decisions. Treatment. There is a need to develop diagnostic tests and to define clinical features that can predict the optimal duration of plasma exchange treatment. There is a need to determine whether early intervention with any treatment in addition to plasma exchange can improve the rate of initial recovery, decrease the frequency of exacerbations and relapses, and decrease the risk for chronic renal failure. Prognosis. There is a need to describe long-term clinical outcomes of patients after recovery from an acute episode of TTP-HUS, stratified by associated conditions, and to document not only the risk for relapse but also the occurrence of renal failure and hypertension. There is a need to define the risks associated with future pregnancies. It is hoped that with evidence from clinical trials, there will be no need for more opinion-based articles such as this on how to treat patients with TTP-HUS. I thank my colleague, Sara Vesely, who has organized and analyzed the data of The Oklahoma TTP-HUS Registry and who provides continual critical assessment of clinical opinions. I thank the staff of the Oklahoma Blood Institute and the physicians of Oklahoma City for their support and our patients for their enthusiastic participation in our studies. Submitted March 3, 2000; accepted April 3, 2000. Reprints: James N. George, Hematology-Oncology Section, The University of Oklahoma Health Sciences Center, PO Box 26901, Oklahoma City, OK 73190; e-mail: jim-george@ouhsc.edu. 1. Rock GA, Shumak KH, Buskard NA, et al. Comparison of plasma exchange with plasma infusion in the treatment of thrombotic thrombocytopenic purpura. N Engl J Med. 1991;325:93-397. 2. Moschcowitz E. An acute febrile pleiochromic anemia with hyaline thrombosis of the terminal arterioles and capillaries. Arch Intern Med. 1925;36:89-93. 3. Amorosi EL, Ultmann JE. Thrombotic thrombocytopenic purpura: report of 16 cases and review of the literature. Medicine. 1966;45:139-159. 4. Thompson CE, Damon LE, Ries CA, Linker CA. Thrombotic microangiopathies in the 1980s: clinical features, response to treatment, and the impact of the human immunodeficiency virus epidemic. Blood. 1992;80:1890-1895[Abstract]. 5. Hayward CPM, Sutton DMC, Carter WH Jr, et al. Treatment outcomes in patients with adult thrombotic thrombocytopenic purpura-hemolytic uremic syndrome. Arch Intern Med. 1994;154:982-987[Medline]. 6. Shumak KH, Rock GA, Nair RC, and Canadian Apheresis Group. Late relapses in patients successfully treated for thrombotic thrombocytopenic purpura. Ann Intern Med. 1995;122:569-572[Medline]. 7. Vesely SK, George JN, Raskob GE. Long term clinical outcomes of thrombotic thrombocytopenic purpura-hemolytic-uremic syndrome (TTP-HUS) among different patient groups [abstract]. Blood. 1999;94:15a. 8. Gasser C, Gautier E, Steck A, Siebenmann RE, Oechslin R. Hamolytisch-uramische Syndrome: Bilaterale Nierenrindennekrosen bei akuten-erworbenen hamolytischen Anamien. Schweiz Med Woch. 1955;85:905-909. 9. Laszik Z, Silva F. Hemolytic-uremic syndrome, thrombotic thrombocytopenia purpura, and systemic sclerosis (systemic scleroderma) Jennett JC, Olson JL, Schwartz MM, Silva FG eds: Heptinstall’s Pathology of the Kidney. Philadelphia: Lippincott-Raven; 1998:1003-1057. 10. Mead PS, Griffin PM. Escherichia coli O157:H7. Lancet. 1998;352:1207-1212[Medline]. 11. Siegler RL, Pavia AT, Hansen FL, Christofferson RD, Cook JB. Atypical hemolytic-uremic syndrome: a comparison with postdiarrheal disease. J Pediatr. 1996;128:505-511[Medline]. 12. Dundas S, Murphy J, Soutar RL, et al. Effectiveness of therapeutic plasma exchange in the 1996 Lanarkshire Escherichia coli 0157:H7 outbreak. Lancet. 1999;354:1327[Medline]. 13. Rock G, Shumak K, Kelton J, et al. Thrombotic thrombocytopenic purpura: outcome in 24 patients with renal impairment treated with plasma exchange. Transfusion. 1992;32:710-714[Abstract]. 14. Mannucci PM. Thrombotic thrombocytopenic purpura: a simpler diagnosis at last? Thromb Haemost. 1999;82:1380-1381[Medline]. 15. Dang CT, Magid MS, Weksler B, Chadburn A, Laurence J. Enhanced endothelial cell apoptosis in splenic tissues of patients with thrombotic thrombocytopenic purpura. Blood. 1999;93:1264-1270[Abstract/Full Text]. 16. Mitra D, Jaffe EA, Weksler B, Hajjar KA, Soderland C, Laurence J. Thrombotic thrombocytopenic purpura and sporadic hemolytic-uremic syndrome plasmas induce apoptosis in restricted lineages of human microvascular endothelial cells. Blood. 1997;89:1224-1234[Abstract/Full Text]. 17. Moake JL, Rudy CK, Troll JH, et al. Unusually large plasma factor VII: von Willebrand factor multimers in chronic relapsing thrombotic thrombocytopenic purpura. N Engl J Med. 1982;307:1432-1435[Medline]. 19. Tsai H-M, Lian ECY. Antibodies to von-Willebrand factor-cleaving protease in acute thrombotic thrombocytopenic purpura. N Engl J Med. 1998;339:1585-1594[Abstract/Full Text]. 20. Moake JL, Chow TW. Increased von Willebrand factor (vWf) binding to platelets associated with impaired vWf breakdown in thrombotic thrombocytopenic purpura. J Clin Apheresis. 1998;13:126-132[Medline]. 21. Oleksowicz L, Bhagwati N, DeLeon-Fernandez M. Deficient activity of vonWillebrand’s factor-cleaving protease in patients with disseminated malignancies. Cancer Res. 1999;59:2244-2250[Abstract/Full Text]. 22. Galbusera M, Noris M, Rossi C, et al. Increased fragmentation of von Willebrand factor, due to abnormal cleavage of the subunit, parallels disease activity in recurrent hemolytic uremic syndrome and thrombotic thrombocytopenic purpura and discloses predisposition in families. Blood. 1999;94:610-620[Abstract/Full Text]. 23. Clark WF, Rock GA, Buskard N, et al. Therapeutic plasma exchange: an update from the Canadian Apheresis Group. Ann Intern Med. 1999;131:453-462[Medline]. 24. Fava S, Galizia AC. Thrombotic thrombocytopenic purpura-like syndrome in the absence of schistocytes. Br J Haematol. 1995;89:643-644[Medline]. 25. Cohen JD, Brecher ME, Bandarenko N. Cellular source of serum lactate dehydrogenase elevation in patients with thrombotic thrombocytopenia purpura. J Clin Apheresis. 1998;13:16-19[Medline]. 26. North American TTP Group, Ziegler Z, Gryn JF, et al. Cryopoor plasma does not improve early response in primary adult thrombotic thrombocytopenic purpura (TTP) [abstract]. Blood. 1998;92:707a. 27. Bell WR, Braine HG, Ness PM, Kickler TS. Improved survival in thrombotic thrombocytopenic purpura-hemolytic uremic syndrome. N Engl J Med. 1991;325:398-403[Abstract]. 28. Rock G, Shumak KH, Sutton DMC, et al. Cryosupernatant as replacement fluid for plasma exchange in thrombotic thrombocytopenic purpura. Br J Haematol. 1996;94:383-386[Medline]. 29. Onundarson PT, Rowe JM, Heal JM, Francis CW. Response to plasma exchange and splenectomy in thrombotic thrombocytopenic purpura. Arch Intern Med. 1992;152:791-796[Medline]. 30. Sarode R, Gottschall JL, Aster RH, McFarland JG. Thrombotic thrombocytopenic purpura: early and late responders. Am J Hematol. 1997;54:102-107[Medline]. 31. Bandarenko N, Brecher ME, and Members of the US TTP ASG. United States Thrombotic Thrombocytopenic Purpura Apheresis Study Group (US TTP ASG): Multicenter survey and retrospective analysis of current efficacy of therapeutic plasma exchange. J Clin Apheresis. 1998;13:133-141[Medline]. 32. Bennett CL, Davidson CJ, Raisch DW, Weinberg PD, Bennett RH, Feldman MD. Thrombotic thrombocytopenic purpura associated with ticlopidine in the setting of coronary artery stents and stroke prevention. Arch Intern Med. 1999;159:2524-2528[Medline]. 33. Rizvi MA, Vesely SK, George JN, et al. Plasma exchange complications in 71 consecutive patients treated for clinically suspected thrombotic thrombocytopenic purpura-hemolytic uremic syndrome. Transfusion. 2000;40:896-901[Abstract/Full Text]. 34. Doerfler ME, Kaufman B, Goldenberg AS. Central venous catheter placement in patients with disorders of hemostasis. Chest. 1996;110:185-188[Abstract]. 35. Crowther MA, Heddle N, Hayward CPM, Warkentin T, Kelton JG. Splenectomy done during hematologic remission to prevent relapse in patients with thrombotic thrombocytopenic purpura. Ann Intern Med. 1996;125:294-296[Medline]. 36. Fearing MK, Spar MD, Kahn MJ. Chronic thrombotic thrombocytopenic purpura masquerading as other disease entities. J La State Med Soc. 1998;150:29-31[Medline]. 37. Siegler RL, Milligan MK, Burningham TH, Christofferson RD, Chang S-Y, Jorde LB. Long-term outcome and prognostic indicators in the hemolytic-uremic syndrome. J Pediatr. 1991;118:195-200[Medline]. 38. Kelles A, Van Dyck M, Proesmans W. Childhood haemolytic uraemic syndrome: long-term outcome and prognostic features. Eur J Pediatr. 1994;153:38-42[Medline]. 39. Gottschall JL, Neahring B, McFarland JG, Wu G-G, Weitekamp LA, Aster RH. Quinine-induced immune thrombocytopenia with hemolytic uremic syndrome: clinical and serological findings in nine patients and review of literature. Am J Hematol. 1994;47:283-289[Medline]. 40. Gordon LI, Kwaan HC. Thrombotic microangiopathy manifesting as thrombotic thrombocytopenic purpura hemolytic uremic syndrome in the cancer patient. Semin Thromb Hemost. 1999;25:217-221[Medline]. 41. Zarifian A, Meleg-Smith S, O’Donovan R, Tesi RJ, Batuman V. Cyclosporine-associated thrombotic microangiopathy in renal allografts. Kidney Int. 1999;55:2457-2466[Medline]. 42. Leach JW, Pham T, Diamandidis D, George JN. Thrombotic thrombocytopenic purpura-hemolytic uremic syndrome (TTP-HUS) following treatment with deoxycoformycin in a patient with cutaneous T cell lymphoma (Sezary syndrome): a case report. Am J Hematol. 1999;61:268-270[Medline]. 43. Fung MC, Storniolo AM, Nguyen B, Arning M, Brookfield W, Vigil J. A review of hemolytic uremic syndrome in patients treated with gemcitabine therapy. Cancer. 1999;85:2023-2032[Medline]. 44. Musio F, Bohen EM, Yuan CM, Welch PG. Review of thrombotic thrombocytopenic purpura in the setting of systemic lupus erythematosus. Semin Arthritis Rheum. 1998;28:1-19[Medline]. 45. Asherson RA, Cervera R, Piette JC, et al. Catastrophic antiphospholipid syndrome: clinical and laboratory features of 50 patients. Medicine. 1998;77:195-207[Medline]. 46. Lin Y-C, Chang H-K, Sun C-F, Shih L-Y. Microangiopathic hemolytic anemia as an initial presentation of metastatic cancer of unknown primary origin. South Med J. 1995;88:683-687[Medline]. 47. Brain MC, Dacie JV, Hourihane OB. Microangiopathic hemolytic anemia: the possible role of vascular lesions in pathogenesis. Br J Haematol. 1962;8:358.